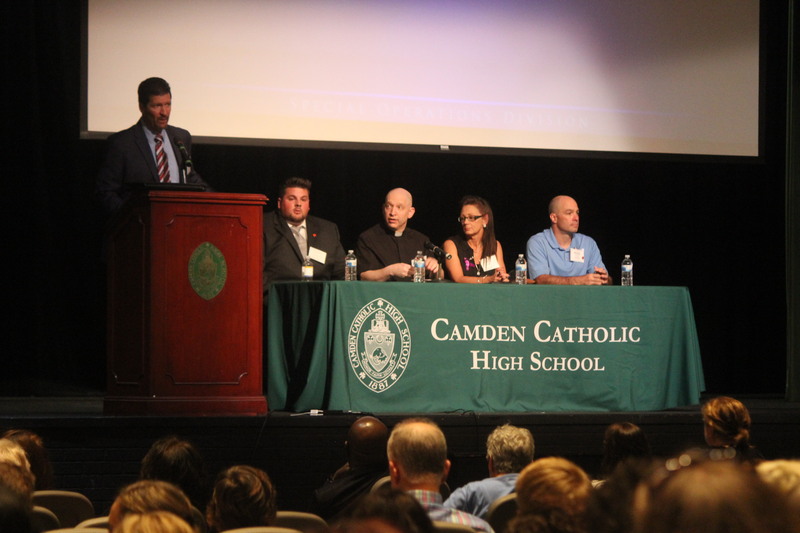 CHERRY HILL — On May 17, hundreds gathered in the auditorium of Camden Catholic High School here for a discussion on a grim problem that communities all across the country are facing. Police officers and parents, school officials and students, addicts and recovering addicts, parents who lost kids, and concerned citizens — all gathered to address the devastating effects of prescription opioids and heroin on individuals and families in the South Jersey region. In his opening remarks, Kevin Hickey, executive director of Catholic Charities, Diocese of Camden, asserted Bishop Dennis Sullivan’s commitment to combating this epidemic with an array of services for addicted and recovering individuals and their families. Louis Capella, Director of Camden County Freeholders, and Jeremiah Daley, executive director of Philadelphia-Camden HIDTA (High Intensity Drug Trafficking Area), also pledged their support. The keynote speaker, Nicholas Kolen, Assistant Special Agent in Charge, at the U.S. Drug Enforcement Agency (DEA), did not mince words in describing the challenges. “In all my years, I have never witnessed an epidemic like this before,” he said. Agent Kolen has worked for the DEA for 25 years in locations both in this country and abroad. Agent Kolen explained that opioids are prescribed frequently, even for minor injuries, to relieve pain. However, the numbing and euphoric effect of the drugs is too irresistible for some patients, and they end up addicted in a very short period of time, craving increasing amounts of the drugs long after the medical need for them has passed. These individuals then resort to buying illegal pills. Once that gets too expensive, they turn to the less costly but deadly heroin. Here in New Jersey, the heroin death-rate is more than three times the national average, at 8.3 deaths per 100,000 residents. Three South Jersey counties — Gloucester, Cape May and Camden — have the highest heroin death-rates in the state. After the keynote presentation, the audience engaged with a panel of participants involved in the fight against drug abuse. “How do you know when you need help?” asked one audience attendee. He regularly participates in a basketball league for recovering addicts where he is able to stay occupied and healthy in a supportive environment. The league was founded by fellow panelist Father John Stabeno, director of Catholic Charities’ Addiction Healing Ministry. Another panel member, Mark Pesotski, was a pharmacist when he began abusing opiates. He explained how he eventually turned himself in, was investigated by the DEA, and has been clean and sober ever since he received treatment. He also cited his Catholic faith for saving him from his addiction while also noting that he has to be proactive every day to not fall back into his addiction. Father Stabeno, who has devoted the last 30 years of his life to helping addicts and their family members, echoed the importance of spiritual healing. “Addiction is a mental and physical disease, but I also believe it is a spiritual disease,” he said. Many in the audience nodded in agreement. Catholic Charities’ Addiction Healing Ministry brings its social and community services to bear, offering help along a full continuum of care — from prevention efforts to treatment referrals, family counseling, relapse prevention and support — for those who have lost loved ones. For more information about Catholic Charities’ Addiction Healing Program, call 1-8555-HOPE4U.